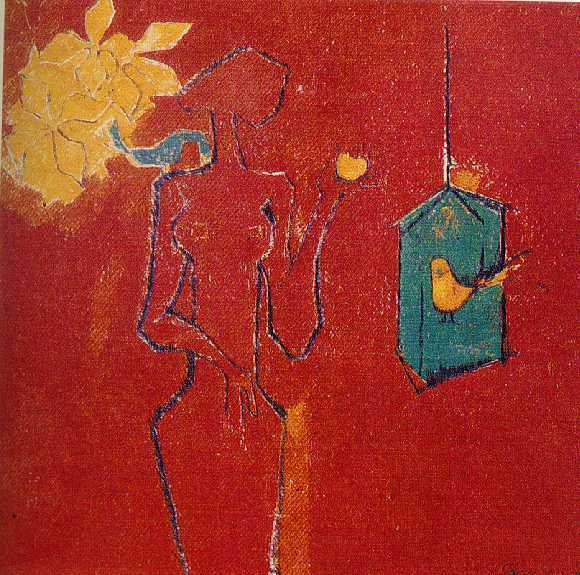 Zubeida Agha enjoys the distinction of the first artist to hold a solo Modern Art exhibition in Pakistan. Held in Karachi in 1949, it kicked up a storm of controversy with its radical interpretation of perspective and space. A student of Sanyal and Mario Perlingieri, an Italian prisoner of war, Agha was initially drawn to Surrealism. Her later education took place at St. Martin’s School of Art. On her return she settled in Rawalpindi, away from the art centres of Lahore and Karachi. Here she continued to paint and support the arts by setting up and running Contemporary Arts gallery. Her personal style of painting alluded to child-like simplicity of form and a preference for pure bright hues in the 1950s. Gradually her imagery became non-figurative with colours and forms evocative of emotions and moods. Among the Lahore Artists Group, Ali Imam became an important art educationist in Karachi. He was the architect of the modern curriculum of The Central Institute of Arts and Crafts. In the 1970s he founded the Indus gallery, to create a buyer’s culture in the city where his student and peers could sell art and make it a viable career. With all these preoccupations Ali Imam’s painting career took a back seat. Although he seldom paints, his work remains in great demand. His technique transforms a realistic form into an impressionistic image. Treated with outer layers of white pigment, an even tone of subdued colours defines the costumes and features. He prefers to paint groups of bulky humans in stiff postures. Ahmed Parvez transferred his restless energy on the canvas with a burst of colour and exploding forms. 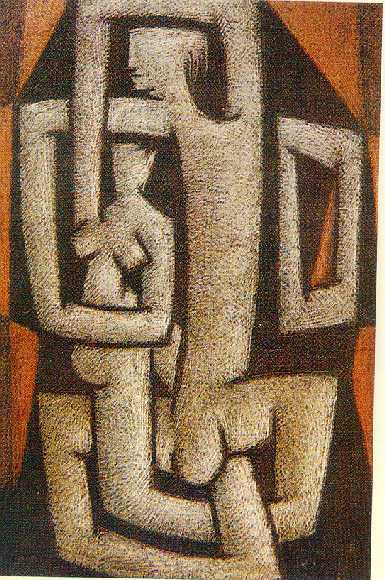 His early figurative art turned abstract during the decade he spent in England from 1955 to 1964. There he became inspired by Alan Davie but developed his own distinct style. His exhibitions were well received in London. On the occasion of his show of abstract miniatures, the critic for The Guardian wrote, "The mood is near Klee as it is to the jewelled ambience of an eastern potentate". 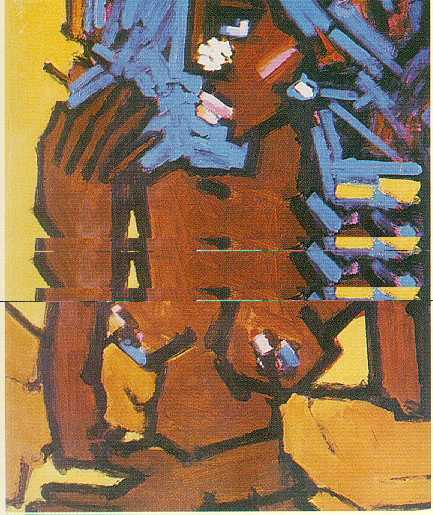 Ahmed Parvez influenced the Karachi art scene in the 1970s both with his personality and art. An uncompromising professional, he was a spiritual mentor to the younger generation and a fierce critic of his peers. His volatile, impatient nature brought him tragedy in personal life, which drove him to ill health and an early death. Ahmed Parvez continued to paint till the end and has left behind a large body of work. In 1978, a year before his death, he was recognised as one of the country’s outstanding artists and awarded the Pride of Performance. A 1947 graduate of the Mayo School of Art, Anwar Jalal Shemza was also among the pioneer modernists. He settled in England but continued to hold regular exhibitions in Pakistan. Geometric patterns entwined with forms inspired from Arabic calligraphy in vibrant colours dominated his later work. It was his exposure to Action painting that motivated Guljee to turn to gestural painting. Over the years he incorporated Arabic calligraphy and textured his works with gold leaf and lapis. His latest most prestigious commission was for the Shah Faisal Mosque in Islamabad.